Have you lost your gas receipt, tax receipt, taxi receipt, restaurant bill or any other receipt? If yes, then don't worry. We'll make one exactly same looking receipt for you. Don't believe? but it's the truth my friend. 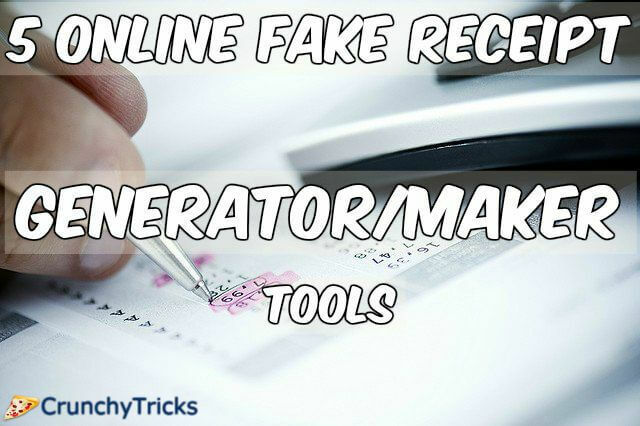 There are a couple of tools available online which claims to generate fake receipt of any kind. You can easily make any type of receipt with these websites. The process is also simple, simply fill out all the required details and boom! your receipt is ready. You might have noticed that I have mentioned online tools here so you don't need to download or install anything on your computer first to generate receipt. One more benefit of all these online receipt maker tools is that you don't need to register yourself there. No need to sign up for an account to make a receipt. These websites are having black receipt template along with a form which is going to be filled by you. This form includes both the buyer and the owner's details. So it comes up with an option to make a real looking receipts. 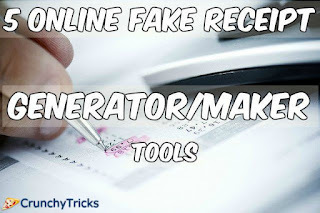 See Also: - 7 Best Fake Walmart Receipt Generator Tools in 2019 Below is a brief description of these tools with their ability as each tool can make only one or two types of receipt. But be calm because we've listed all those tools which are required to make any type of receipt. Custom Receipt Maker lets you make your own custom receipt in case you lost one. Navigate to the website and you'll notice that you're provided a receipt template along with a from including some text field. First three text fields are for "Top Lines". This lets you add text on the top of your receipt. Those texts can be anything say store's name, clinic' name and many more. While second and third line can include their address or any tag line corresponding to the store or clinic name. Further you can add Items along with their price. You can add up to four items in your receipt with their price value. If you wanna create a receipt of purchased goods then this is the best receipt maker for you. At last you can add any bottom line if you want. Most of the times bottom line is an instruction given to the customer. When you've fill out all the details then just click on "Make the receipt! ", that's it. It will show a receipt of all the details you entered along with grand total of price. Note: - This tool calculates total of only dollars, so if you're going to enter any other currency then simply select "don't show a total" from the drop down menu. Here I have generated a custom receipt of mine from this tool. You can check it on below image. As you can see that I have made a fake receipt that looks like to the original one. One more easiest and free way to create sales custom and fake receipts. You can say fakereceipt an advanced version of custom receipt as it opens the door to add more information into your receipt. There are three main steps included in the receipt generation process. The first step is "Seller information" which include several information such as Seller slogan, store name, address, city, state, postal code, cashier (name or number), customer (name or number), payment method and return policy. You can notice that every information filed is provided to make your receipt looks original. On proceeding you can see second step as "Purchases" which includes items (along with their price value), tax rate %. You will get an automated calculated grand total of the prices you entered. Last step is "Make receipt", in this step you can choose currency symbol (USD $, EUR €, GBP £), currency symbol position(left or right). Fakereceipt also have an option now to create different style receipts such as Aged Old Style Thermal, Clean Old Style Thermal and many more. You can see a demo of one fake receipt generated by fakereceipt.us below. Another great tool using it you can create online gas receipts. 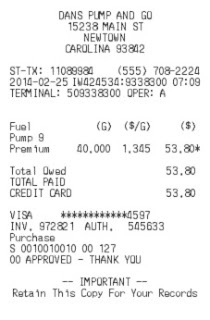 It's an online tool to make free gas receipts for US and Canada. It's one of the best tool to create Canadian receipts. If you had paid for the fuel and forgot to get a receipt then this tool is for you. It's a little bit different tool from others. It calculates the price first before going to receipt information. Basically it also consists of three main steps (Calculate fuel totals first, Gas station details, Fuel purchase details) . Complete all the steps and your receipt is ready. You've two options in first step, you can either calculate total price from fuel quantity or calculate fuel quantity from total price. Secondly you can proceed to enter gas station details such as Country (Canada, USA), Complete address (street name, street address, city, state, postal code, area code), tax % where you purchased. At last just enter fuel purchase detail (measure, product type, quantity, price per G/L, cash paid, credit card paid, credit card name, credit card last 4 digits). When all the information is updated in the required text field simply click on Create/Update Receipt button. 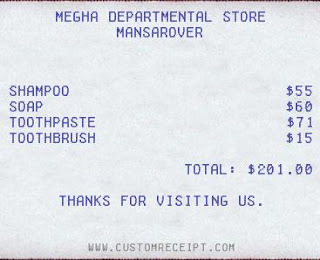 You can see a demo of one such receipt in the image below. This was one of the essential which must exist in this list. If you've lost your ATM sleep accidentally or wanna prank your friends with millions of money existing in your account then this website is for you. The thing I loved about this tool is its accuracy. 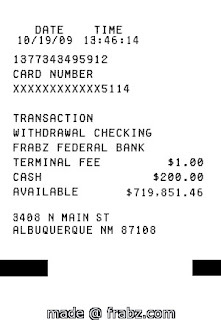 The ATM receipt generated looks like we've just got it from the ATM machine itself. One more lovely feature of this fake ATM receipt maker is that it doesn't ask you to enter much information simply enter some common information such as date, time, balance, address, city and state. One previously made script is shown below. Last but not the least losthotelreceipt is a tool to create hotel receipts. If you're a hotel owner and wanna provide your customers a receipt as invoice then you're at a prefect place. It won't be ever this much easier to create hotel receipts. The tool has all the required options which must be present in a hotel receipt. Just enter all the information and serve it to your customers. So friends this was all about how to make receipts online in case you've lost your. We've added all type of receipts making tools in the guide. If you think we've not mentioned any tool then comment below and we would love to share it with our readers. If you've any doubt regarding this article then feel free to leave a comment below in the comment section. Agree! expressexpense.com blows the doors off these other basic tool. for 12 bucks... not useful when you need a 20 dollar receipt..